Building Strong LeadersThe leadership and life skills learned through Scouting help to prepare young men for the future. Leading with IntegrityThe principles of the Scout Oath and Law teach us how to be strong leaders with high moral character. Troop 371 is a ministry of Lakeview Baptist Church in Auburn, Alabama. The Scouting program provides an excellent opportunity for us to mentor young men, teaching them values and leadership skills through the Boy Scout program. These values line up with biblical values that we believe in and want our young men to adopt as their value structure. 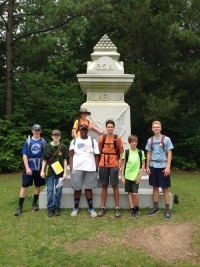 Troop 371 is an active Scout Troop serving young men in the Auburn and Opelika area. Baden-Powell, the founder of Scouting, once said that Scouting is a game with a purpose. At Troop 371, we have fun but the boys learn leadership and character through our activities. At Troop 371, our goal is to have one unit outing each month. These outings range from multiple day camp-outs to day activities like a hike or community service project. We have at least one long-term (week long) camp each year which is normally a trip to a Scout Summer Camp. All of our outings from destination to menu are chosen and planned by our boys. Troop 371 meets weekly during the school year and every other week during the summer. Guests are always welcome to visit but we recommend that you contact us first to insure that there has not been a schedule change. We meet on Mondays, 7:00 - 8:30 at Lakeview Baptist Church, room N103. Troop 371 was founded in 1994. Since that time, hundreds of young men have participated in this troop. We are an active unit with regular outings and activities for our members. We strive to provide a quality program for our Scouts and have been extremely successful in growing boys into quality young men through the Scouting program. 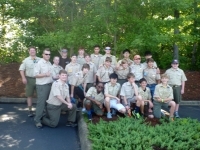 On Sunday morning, June 14th, 18 scouts and 5 adults departed for the north Georgia mountains to spend a week at summer camp at Camp Rainey Mountain. CRM is the Northeast Georgia Council's summer camp located just outside the town of Clayton, Georgia. Of the 18 scouts, most decided to fill their schedules with merit badge classes, but a few took part of the First Year Camper program, aptly named "The New Trail". One scout, Brandon, chose to participate in the "Gold Rush" program for older scouts. Considering the friends he made, we think he had an enjoyable week. We had a great time at Shiloh National Military Park earning a 50 Miler Award. Check out all of the details in our Troop History section. Taking advantage of the Memorial Day weekend, a group of 7 scouts and 6 adults headed north to Tennessee to visit and camp at Shiloh Military Park for 5 nights. We departed from the church early on Friday morning, stopping in Tupelo, Miss, for lunch en route to the campground to set up our home for the week. Well, it has been a long time coming but Troop 371 finally has a new website. We hope that you enjoy it. On Saturday, June 28th, nine scouts and two leaders departed Lakeview’s parking lot destined for Camp Daniel Boone outside of Waynesville, North Carolina. This was Troop 371’s second time to attend camp at Boone in three summers, with 2012 being the first trip. However, this was the first time for everyone, leaders included. We attended Camp FGL as one of the two summer camp destinations in 2014. Three scouts and two adults from Troop 371 attended the 2013 National Scout Jamboree in West Virginia. The National Scout Jamboree is an event that is celebrated approximately every four years. From 1981 through 2010, the Jamboree was held in Fort A.P. Hill, Virginia, just outside of Washington, DC. The 2013 event was held for the first time on property owned by the Boy Scouts of America, now its new home, the Summit Bechtel Reserve (SBR), is a huge playground, adjacent to the New River Gorge National Recreation Area, filled with thousands of acres for exploration by its visitors. In 2013 we returned to Camp Woodruff in north Georgia. Camp Daniel Boone in North Carolina was our summer destination in 2012. We spent our summer camp week in 2011 at Camp FGL. In 2010 we took a great group of guys to Camp Thunder in central Georgia. Camp Tukabatchee is just north of Montgomery and was our destination for 2009 summer camp. In 2008, we returned to Camp Sequoyah for another great week. Our summer camp experience in 2007 was in the Flynt River Council at Camp Thunder. In 2006 we spent summer camp at Camp Sequoyah which is a camp run by the Greater Alabama Council. In 2003 we returned to Camp Lumpkin for summer camp. Our second Fifty Miler canoeing was on the Cahaba River in May 2003. Our first trip to Camp Thunder on the Flynt River was for Summer Camp in 2002. Camp Sequoyah is a beautiful setting just south of Cheaha Mountain. We had summer camp there in 2001. In 2001, we spent our Spring Break hiking in the Cataloochee area of the Great Cmokey Mountain National Park. Troop 371's long term camp for 2000 was a canoe trip down the Cahaba River. We departed from Auburn on May 29 and returned on June 3. After traveling to the Harrisburg bridge (about 10 miles south of Centreville, AL) we spent the rest of the week on the river, finishing out trip at Alabama's first capitol, Cahawba. The section of the river that we traveled was 69.8 miles. This was quite an accomplishment for these young men (and for some of us older ones too). 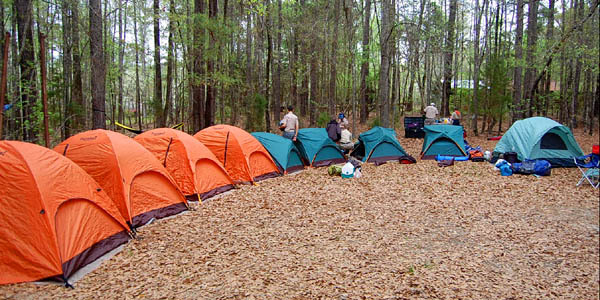 Troop 371 was part if the first camping season at Camp Lumpkin. In 1998, we attended Camp Woodruff in North Georgia. In 1997, Troop 371 attended Camp Pine Mountain for Summer Camp.